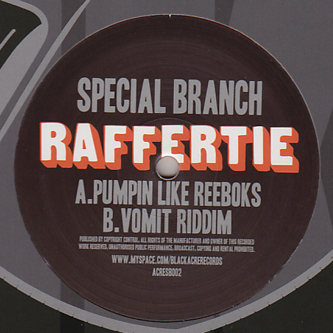 **Orange Vinyl** Raffertie comes to ruff up the rave with two steppers for Black Acre's sublabel, Special Branch. 'Pumpin Like Reeboks' rules the A-side with warping Bassline traits altered for the spooned rave crew, hence the helium vocals and liberal use of digital FX. On the flipside we get 'Vomit Riddim', literally taking the title for the sickest drop in dubstep with regurgitating peaks cleaving a murky subs driven halfstepper in all the right places. To be fair, he's not the first person to do this, check Otto Von Schirach's 'Pukology' to hear this taken to the nth degree, but it's guaranteed to induce a wry grin here and there.